About 87% of Uzbekistan's citizens follow the Sunni Islamic tradition. The country is famed for its glorious mosques and madrassahs. There are also Christians, most of whom follow Russian Orthodoxy. The Jewish population is numbered around 5,000 in Uzbekistan. Here are three of Tashkent's churches well worth visiting. 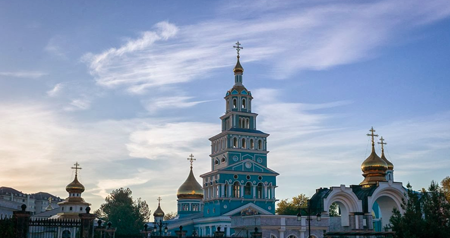 Tashkent has four Russian orthodox churches, the largest being the Uspensky (Holy Assumption) Cathedral, which has been the cathedral of the Tashkent Diocese since 1945. The cathedral began as a small church in 1879, attached to the Gospitalniy (hospital) cemetery. Little by little parishioners paid for the enlargement of the building and its grounds. During the early Soviet period, the cathedral was closed and used as a storehouse and garage. However, from 1945 it was returned to the Russian Orthodox church. The building has been completely rebuilt and is especially crowded during Easter, when Tashkent residents join night services and the Easter procession. There is a theological seminary in the grounds. The cathedral is in Avlieot Street, not far from Tashkent's main railway station. It is open daily from 0900 - 1800. The Sacred Heart of Jesus Church is popularly known as the Polish church because Polish soldiers stationed there in Tsarist times wished to have a place of worship. 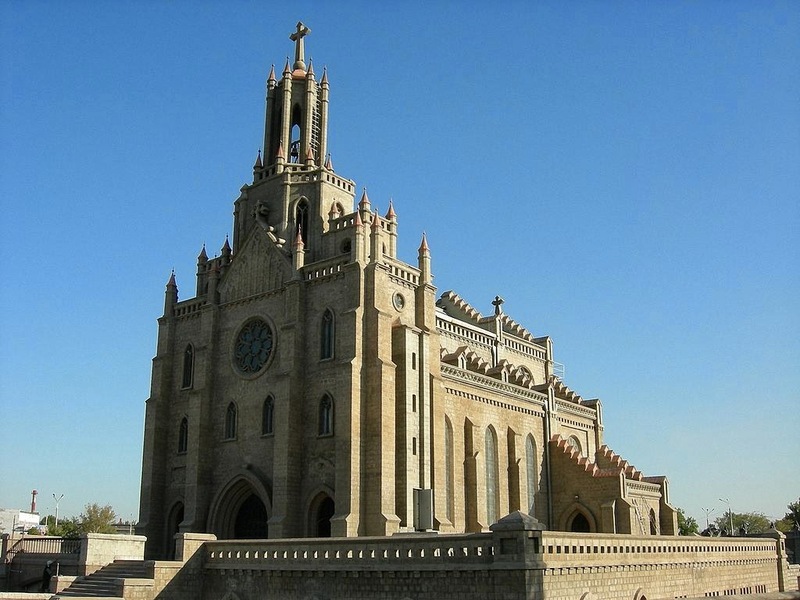 Under the guidance of the influential curate of Turkestan, Justin Bonaventure Pranaitis, construction of the cathedral began in 1902. It was designed by the famous Polish architect Ludwig Panchakevicha. Many soldiers worked on the construction and their families donated funds. However, work was slow and funds limited. Construction ceased in 1917. During the Soviet period it was used as a hostel for the Electrical Cable Plant and the Republican Obstetric School. The church was reconstructed several times and eventually was abandoned. Church relics and decorations were lost over the years. As were the original design plans. In 1976 the building was handed over to the Ministry of Culture of the Uzbek SSR, and in 1981 it was recognised as a historical site in Uzbekistan. Catholic activities resumed in Uzbekistan in 1987 and from 1993 - 2000 the church was restored and is under the care of Polish Fransiscans. The interior of the church is beautiful. You can visit the church from 3 to 5 pm; mass is conducted in Russian, Korean and English. It is located at 80/1 Musahanova Street, Tashkent. Construction began on the Evangelical Lutheran church of Uzbekistan in 1891 and the first service held in 1896. Designed by architect A. L. Benoit (who also designed the Palace of Prince Romanov in Tashkent), the funding came mainly from the German community of Tashkent. During the Soviet period, the church was used as a concert hall. 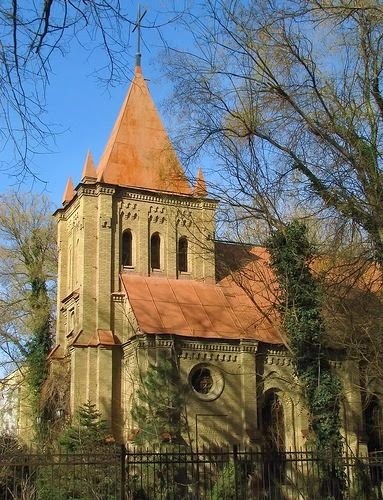 Solidly built of yellow brick in neo-gothic style, the building withstood the Tashkent 1966 earthquake and was returned to Tashkent's Lutheran community in 1991. The majority of parishioners are ethnic Germans; the church provides a setting to pass on the faith, language and customs of their ancestors. Some are the children and grandchildren of those who were christened and confirmed in the church during its early years. In 1996, to celebrate the 100th anniversary of the church, the bishop of the Evangelical Lutheran church of Uzbekistan, Cornelius Vibe, arranged a mini-van *ride* from Tashkent to Salzburg. Along the length of this impressive route, he visited Lutheran communities and acquainted them with the history and present-day activities of the Tashkent church. Services are held on Sundays, in German and Russian. The church is at 37 Sadiq Asimov Street in central Tashkent.